18th C, Elm, Shanxi. Traditional construction; original drawer pull; natural tree lacquer over core wood. 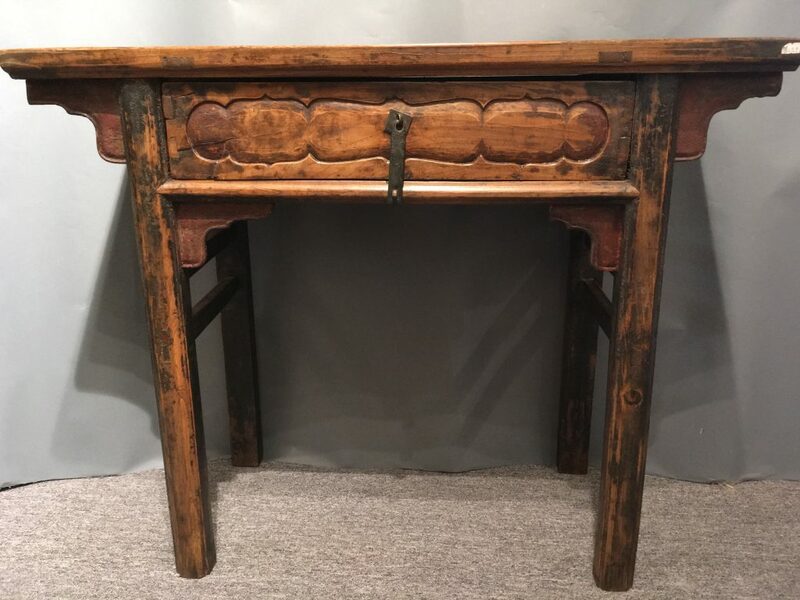 40″ w, 16″ d, 33″ h.
This table has the traditional mitered, mortise-and-tenon construction. It has a floating panel at the top, with ends of tenons showing on the surface. The drawer and legs are recessed under the top. The drawer is of dovetailing construction. The front shows relief carving of a “taohuan-shaped” panel with original iron pull that can be locked to a ring secured to the “sword-ridge” molded stretcher below the drawer. There is no apron below the drawer, just a short curvilinear beaded spandrel below the stretcher at each end between the legs, and same-shaped spandrels under the table-top panel. Two side stretchers span the legs. This small table has a clean profile and can easily fit into any room in a contemporary setting. The table was originally painted with a dark lacquer but only traces remain. The spandrels show a red lacquer finish. Other than having some lacquer faded with age, this piece is in excellent condition.